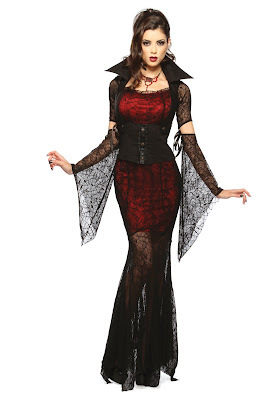 This Midnight Vampiress costume features a velveteen bodice and black lacy sleeves. Leg Avenue's Midnight Vampiress costume features the same lacy sleeves, but is a sexier style. The Men's Midnight Vampire costume comes with the cape, the waistcoat, and a dickie with attached burgundy tie. For a more elegant, historical look, here's the men's Midnight Stalker costume. The Midnight Vamp costume features a long slender profile, popped up collar, and extra long lacy sleeves. The Midnight Ritual costume features red ribbon lacings and a lacy net hood. "Midnight Mistress" features a really short lacy skirt. Here's a Midnight Vampires couples costume, but I'm skeptical about "One size fits most." If you're doing a family group vampire costume, here's a midnight vampire costume for boys. And here's a Midnight Vampiress costume for girls. This short costume is called Wicked Midnight Vamp. For a longer, less revealing costume, here's Midnight Vampira. This vampire robe costume is called Midnight Carnival.